In search of some actual snow, we jetted off to the Lake Tahoe, on the California / Nevada border. We stayed in a Casino hotel, which was cheap and had the benefit of convenient 24 hr access to gambling. In a week, we boarded two days at each of Kirkwood, Heavenly and Squaw. The mountains were bigger than our local Vermont spots, but were suffering from the same late start to the season, and could have done with more snow. 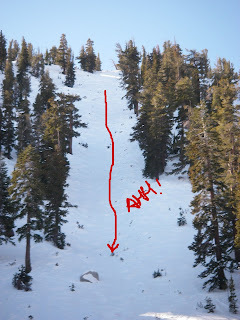 Motts Canyon at Heavenly, and the Kirkwood gullys were the definite highlight, along with Max's terrain park at Squaw. Move of the week has to be Cheryl's 'slide' at Motts Canyon. On our return to Vermont, we found that we'd had more than a foot of snow in our absence, so or trip ended just in time for VT snow action at Stowe!